This is the second CD for the Ars Produktion label by this quite young Mexican pianist, following on from last year’s ‘Dance Passion’. That issue featured Spanish music, alongside South American composers such as the Argentine Alberto Ginastera and the Venezuelan Moisés Moleiro. 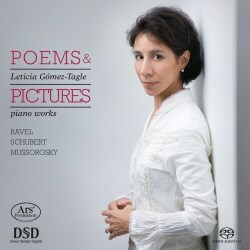 There’s always the danger for emerging artists to get stuck in repertoire-niches; so it is good to find her producing here a programme of wider origins, including two of the greatest challenges for pianists – Ravel’s Gaspard de la Nuit and Mussorgsky’s Pictures at an Exhibition. And she rises to those challenges superbly. She is not an inherently showy player; her most immediately characteristic qualities are the strikingly beautiful sounds she draws from her piano. The first movement of Gaspard, depicting the water-nymph Ondine, produced ripples of unalloyed pleasure up and down my spine, a sure sign that she’s found the poetic essence of this masterpiece. That feeling for pianistic texture is a major feature of her playing, and is revealed in quite a different way in the chilling second movement, Le Gibet. And if the third, Scarbo, in its description of an evil, goblin-like spirit, is indeed amongst the most difficult pieces ever composed for piano, then she betrays no sense of technical inadequacy whatever; rather, one’s concentration is focussed on the vivid imagery of the music. In Pictures, though the style of the writing is so very different, as are the demands made on the performer, Gómez-Tagle’s qualities come through just as strongly. She is thoughtful, poetic, and always sensitive to the kaleidoscopic moods of this great work. This is not a ‘barn-storming’ performance, but possibly all the better for that; that is not to say, though, that she doesn’t go full-out for the big moments. She does, and, even if she doesn’t yet have quite the spectacular range of keyboard colours displayed by Steven Osborne in his superb Hyperion recording, she still manages a huge variety of tonal variation, alongside a silvery clarity in the lighter numbers, such as the Ballet of Chicks in their Shells, or Tuileries. In between these two behemoths of Ravel and Mussorgsky, she gives us a couple of Liszt’s transcriptions of Schubert songs, which not only provide a stylistic ‘cushion’ between the big works, but also provide an ideal opportunity to demonstrate her command of the singing potential of the piano. This is quite an issue, emphatically recommended to all those who love pianism and great piano music.